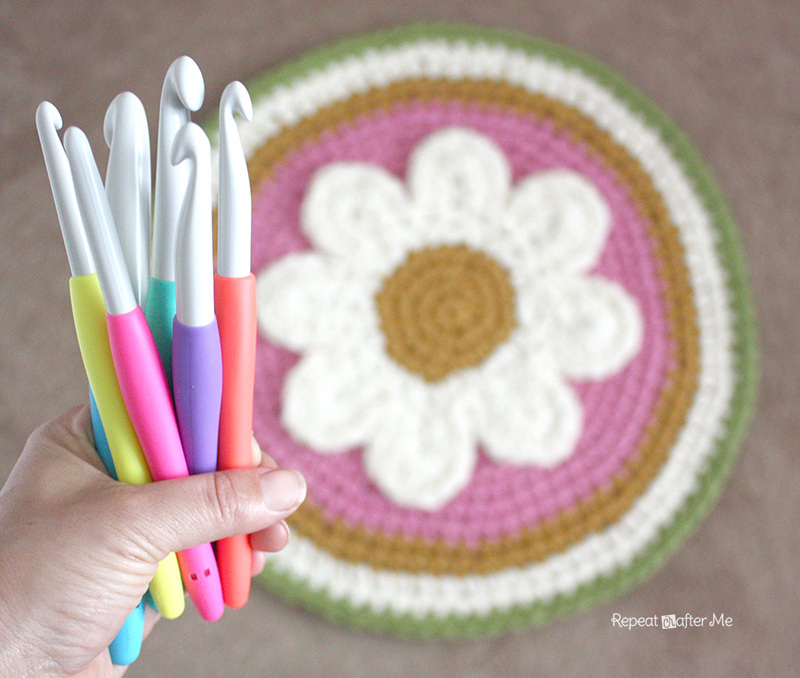 I am so excited that Clover USA came out with larger Clover Amour crochet hooks! These hooks are not only beautiful, but they so light and extremely comfortable. 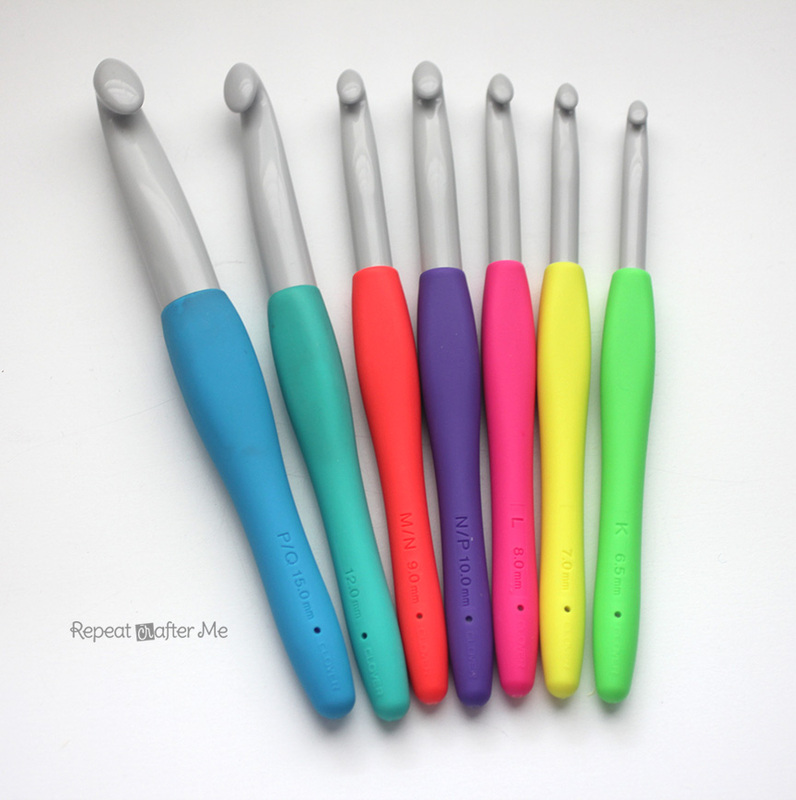 The shape and grip really lends to smooth crocheting. It feels like the yarn just glides over the hook! 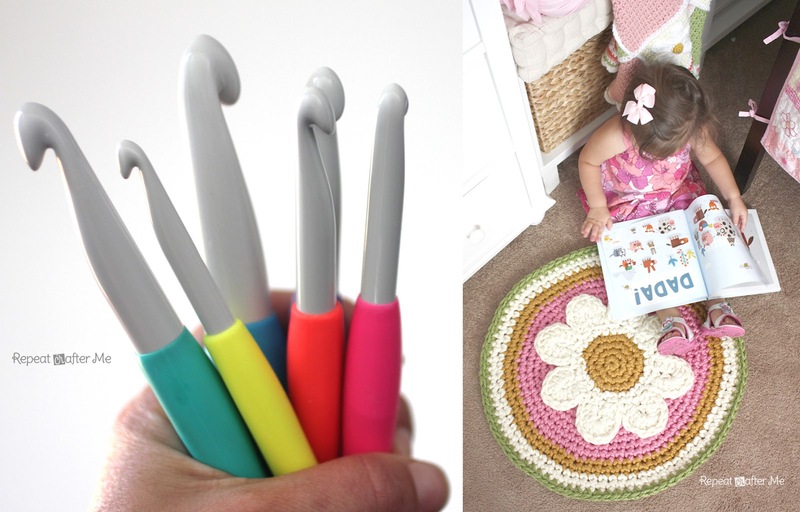 Dare I say making you a faster crocheter? It is possible! 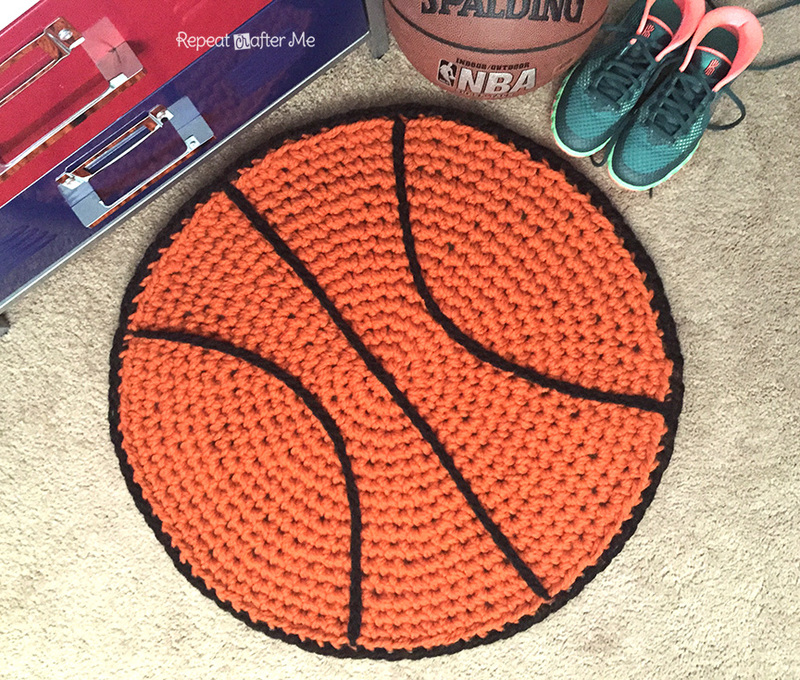 You may have seen the first project I made with the jumbo 15mm hook: A Basketball Rug for my boys room! 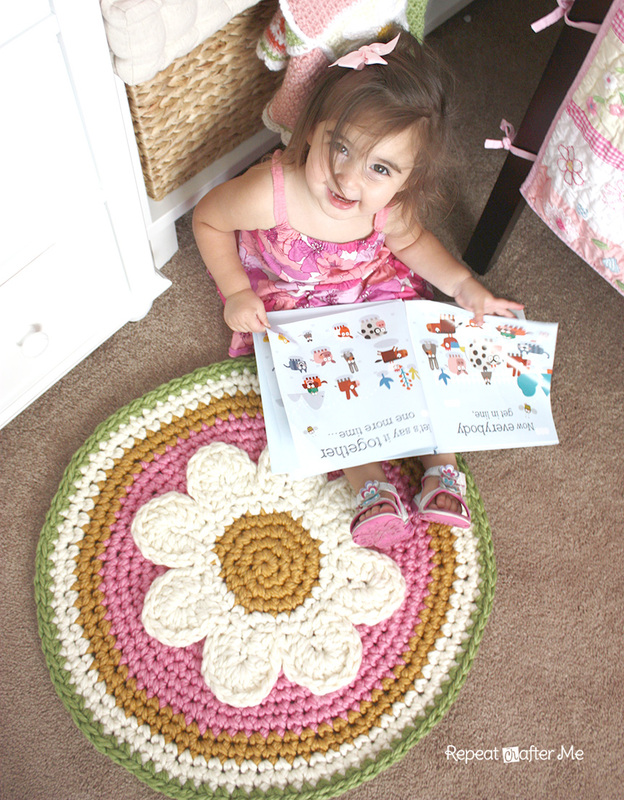 Now I made a version for my daughters room: A Crochet Daisy Rug made with the 12mm hook and super bulky yarn! One thing I love about crochet is being able to alter a pattern just by changing the hook size. You may recognize this daisy pattern. 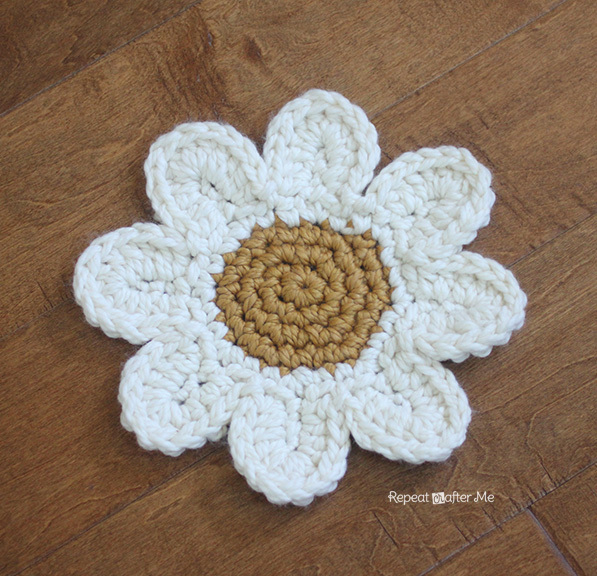 It is actually a coaster pattern by Whiskers and Wool (you can find the pattern HERE) but by using chunky yarn and a 12mm Clover Amour hook, I was able to make this daisy big enough for a rug! Use any of the large Clover Amour hooks to adjust the size of this daisy! 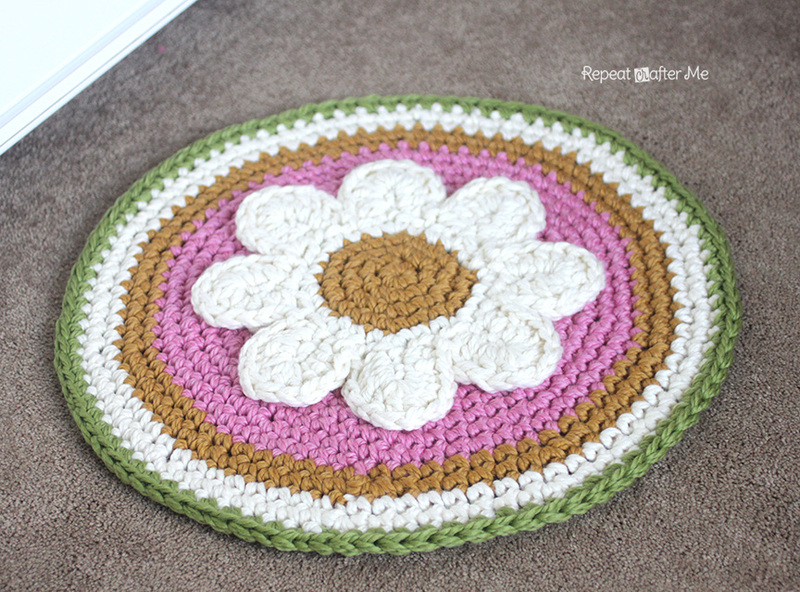 I appliquéd the daisy on to a simple circular rug using the same pattern as the base of my Basketball Rug. You can find the pattern HERE. For the daisy rug I used Loops & Threads Cozy Wool Super Bulky yarn which is sold at Michaels Crafts stores. The good people at Clover have offered to host a giveaway for a set of these Large Clover Amour Hooks! Thank you to Clover USA for letting me try out the new Clover Amour Hooks and allowing me to host a giveaway! I was not compensated for this post. All thoughts and opinions are my own! 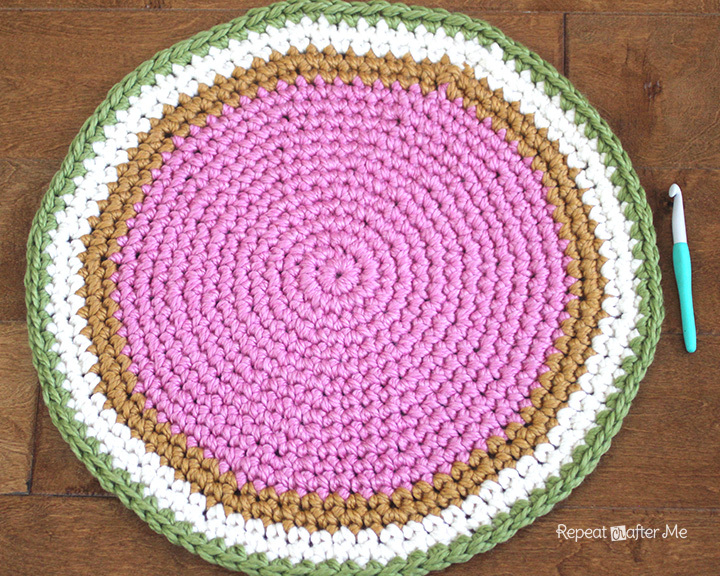 If you like the daisy rug, check out the BasketBall Rug I made for my boys! Would love to have this set, The larger grips look like they would be good for those with arthritis. How wonderful thankyou for this wonderful prize Clover and Repeat After me.. 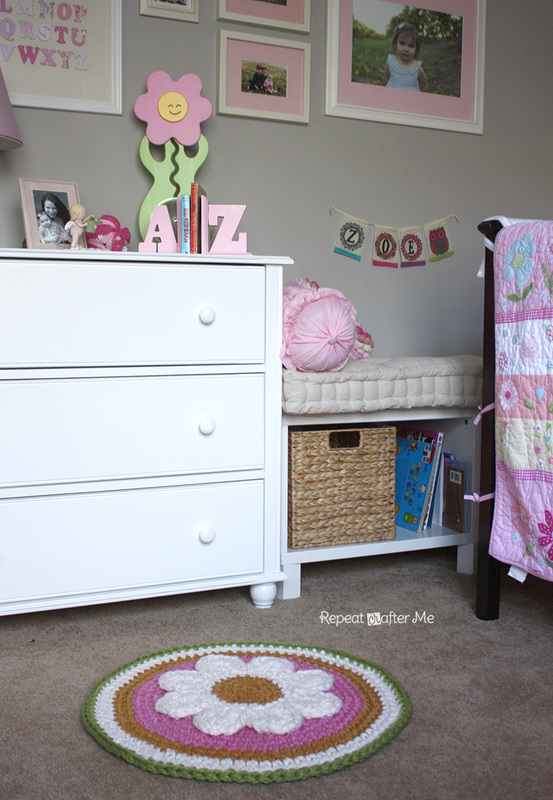 I would love to win these so I can make one of these beautiful rugs for my daughter's rooms. Thanks Sarah and clover! WOW, I can't believe this coincidence. I have just spent several hours looking for a decent set of jumbo hooks. Would be a dream to win these. Thank you Sarah Zimmerman & Clover for the opportunity to win these hooks! Love it!!!! Thanks so much!!! This is so awesome. Love clover hooks! Wonderful gifts and thank you so much for a chance, I did first time join into this giveaway. The big hooks would be nice for seniors or elderly people who I volunteer to teach them crocheting the newborn beanies that we will donate to some hospital or pregnancy center. Will you be sharing the patterns you made? I'm not very good at altering an existing pattern. Love those Rugs — awesome! thanks for the chance to win!!! great project!! Love Clover hooks. So excited they are available in larger sizes now! Thanks for the fantastic giveaway! Yay! I entered the giveaway…crossing my fingers:) Thanks for hosting this! Love how you used a bigger hook to make something else. Thanks for the inspiration. Oh these are awesome! We can't find large hooks like that here in South Africa! WOW… these rugs are so beautiful and that basketball one is super cool! These large hooks are super awesome. Hope I can win them and start making rugs for my girl's room 😀 THANK YOU for the chances to win! I would love to win these large hooks. So tired of the craft stores only carrying a few smaller hooks. Never the larger ones. I would love to try making a rug with some chenille yarn that is in my stash. I’m so excited to make this for my daughter! Did you use one strand of yarn for the daisy, or did you double it? Well, that was a quick giveaway! Two hours after I get the email announcing the hooks, the giveaway is over. I wish the craft stores would start carrying these hooks. Thank you so much! These are amazing! When I won them I was so excited! Thank you! Love love the rug!! Wanna make one for my daughter. How much yarn did you use? It was double stranded, right? Thanks for any tips! That is the fitting blog for anybody who desires to seek out out about this topic. You realize so much its virtually onerous to argue with you (not that I actually would need匟aHa). You positively put a brand new spin on a subject thats been written about for years. Great stuff, just great! wow here is what i was searching. You positively put a brand new spin on a subject thats been written about for years. Great stuff, just great! The kits are very nice, and cute. The products you make are very beautiful.